I love my dogs, every single canine I’ve ever owned and in my lifetime that has been 4. Each has a story that has shaped them into the canine loving person I have become and my current group are the motivators behind my dream for becoming a dog trainer. I’ll start from oldest to youngest. Don’t worry, they’ll be featured often in this blog for demonstrations and to share with you what they love (and despise!) to do! Michaux came after an adoption failure through the Richmond SPCA. My roommate and I had decided that we needed a dog to balance out the three cats we shared a home with. 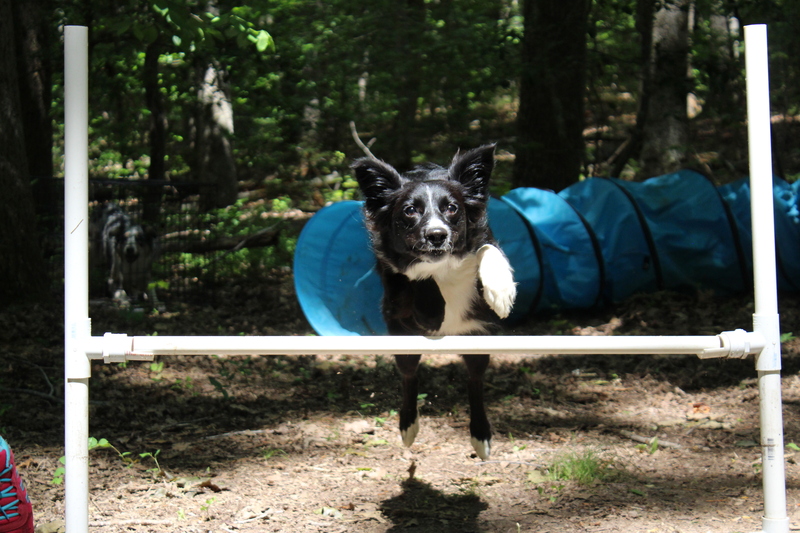 After our first rescue failure I turned to all of the local Border Collie rescues in my local vicinity and searched for one that I could train in agility. I reached out to ARBCR to apply for a dog that would make a great agility prospect but the email I received back was very discouraging so I began researching more. Weeks went by with little interest due to the requirements placed before rescue groups: must have a fence, must have another canine companion, no cats, no dogs, only soft food— the list goes on and on for the reasons why many of the border collies in rescue were not good matches for me. I had gone to a few shelters, I had researched them online. I have an intense love for the herding breed and 99 % of the dogs in Richmond, VA shelters are pits and pit mixes. I knew I wanted a border collie, or at least a mix. 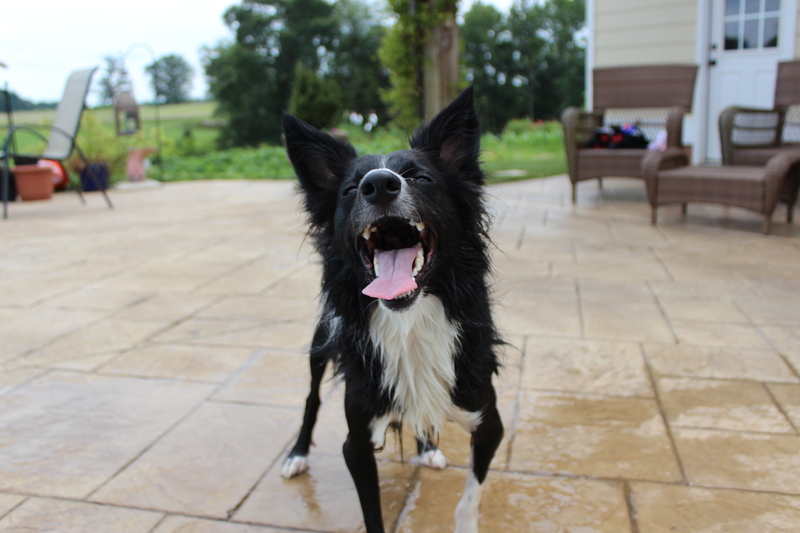 After living an entire life with nothing but Shelties and German Shepherds and Old English Sheepdogs I wanted a Border Collie to compete in both agility and herding. One Sunday night I was clicking on and off the shelters, looking once more when I saw her. She was listed on the Henrico County Animal Control website in kennel DA2. Her ears were up, her tongue was out, and she looked so happy I could barely contain my excitement: not only was she an older dog but she looked like a border collie (of course, this is before I had borders myself!). I showed my friend, who was skeptical– our land lord at the time had said small dogs and this girl was a decent size. I convinced her that this pup was the one and Monday I called the facility. I was informed that she would be held until Thursday to make sure that her original owners did not want her and at that point she would be available for adoption. Wednesday I called late in the day and was told she was still there. So, Thursday my roommate and I woke up, I called out of work and we made the 1 hour trip to Henrico to meet her. She greeted us in a little room where I instantly fell in love with her: drool, hair, and excitement met my own enthusiasm and my friend was smitten enough to put the money down on adopting her. This wild child has been mine since January 2011 and I wouldn’t change a thing about her. 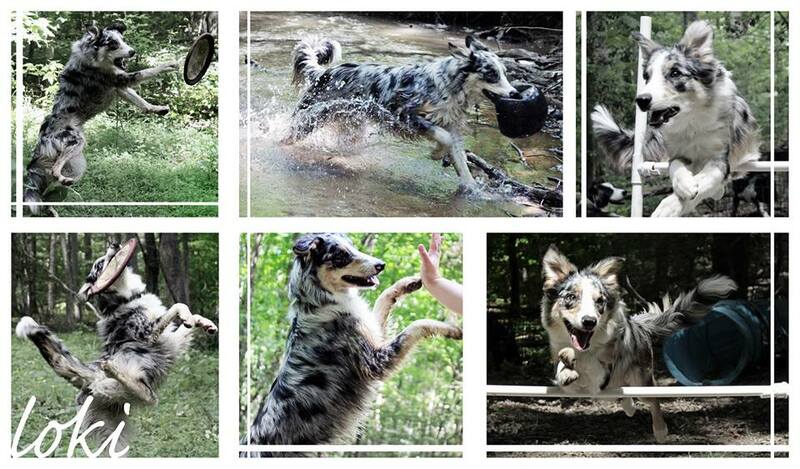 After adopting Michaux I began looking online for a border collie. My initial meet-and-greet with Michaux had shown (what I thought) was a dog with energy and ability. It turns out it was hyperactivity and enthusiasm because once we got her home she was content to chase the ball for a little while but her true love was keeping your vacated seat on the sofa warm. 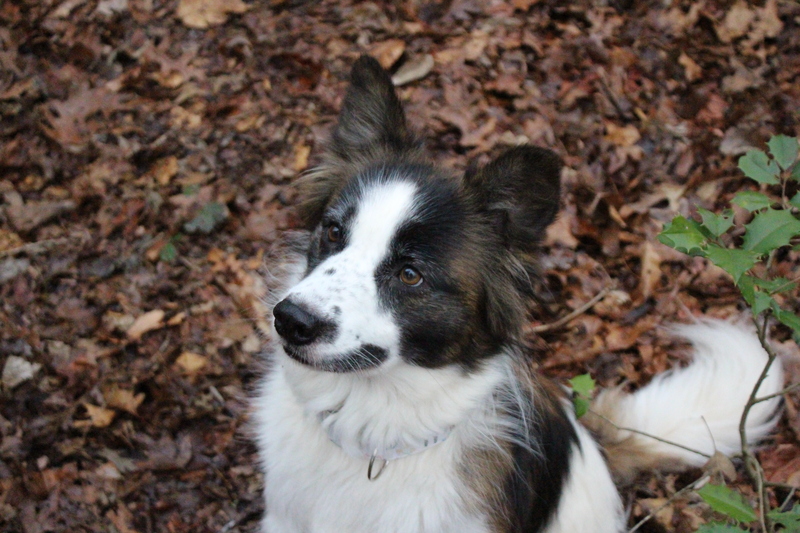 I wanted an agility prospect, a border collie that could vault off my chest after the Frisbee, soar over agility jumps, and speed across the field to collect a flock of sheep. Once again reaching out to the rescues didn’t yield much in results so I started looking at breeders. There were many online that shipped puppies in from other states but I decided to stay local. An ad in the Richmond Times dispatch advertised border collie puppies. I contacted the man and he boasted of all the things his previous litters had done, how he remained a part of the pups life, and how the mother came from Lacy’s Border Collies which is a very highly known breeder in the Richmond, VA area. I still had some reservations about this man in particular because he sounded like a backyard breeder and in the past I’ve never known anyone to have success with this type of individual but he threw down the name of a reputed breeder and no breeder just gives her puppies away without some inclination on how the dog will be treated in its new home. On Friday I drove into Chester and met the man with the puppies. He had a litter of 9 and I knew that this wasn’t a good situation: mom was kept out in the yard in a fence any determined male could climb. The puppies, just barely 6 weeks old, were kept in an outdoor kennel and all were drenched in water and their food looked absolutely foul. They were yipping for their mother and she whined at the fence. Before I could back out he asked “wanna go in”? Many things could have been different if I hadn’t gone into that 10 x 10 kennel but I couldn’t resist. Puppies swarmed my feet, clamoring to get some attention. I picked up a few and none of them really excited me. I knew mentally that these puppies would never make agility prospects, I KNEW but something gave me pause as the worm-bloated pups continued to greet me enthusiastically. There was one pup, half the size of her litter mates, trying to get to me back she couldn’t cut through their ranks. I reached over and picked her up and she looked at me as I studied her. She was calm, placid almost as I held her and her dark eyes were big and soft. She was drenched in water, shivering (oh, I forgot to mention this was in February and they WERE OUTSIDE! ), and waiting patiently for me to pass judgement. Pulling her against my shoulder my chest squeezed when her tiny, frigid nose burrowed into my neck. I knew then I wasn’t going to leave her here. 6 weeks old and this man cared nothing for any of them. So I purchased her, went home, and raised one of the most affectionate, enthusiastic dogs of my life. She has fear issues in a lot of ways, she has elbow luxation, but Io has taught me so much more about the relationship that can grow and strengthen if people are willing to work with their dogs.